I'd like to make one thing very clear: When it comes to my personal shopping list, I'm not a sharer. I'll give you my food, my time, some money, advice, I'll even lend you a piece of clothing if you'll look after it. Whatever you want. I like to believe I'm a fairly generous soul, but if you want to buy the same thing as me? Well, honey, you gotta wait until I've had it for at least a week. This all comes down to the fact that I don't really like following trends or the pack. To me, wearing the same must-have item as someone else is to be avoided at all costs. It's the little fashion rebel in me wanting to be unique and different (although I am probably neither IRL). So to share my below shopping picks before I've even bought them is a really big deal and a huge step forward in our relationship. A good party/evening/wedding bag is worth investing in, as it can liven up many a boring outfit. This bright smack of yellow will work surprisingly well with many outfits—from a sharp tuxedo to the above flouncy dress. These have been in my wish list for a while now. Versatile, elegant and with the kind of heel I can last all day in, they will look just as good in five years' time as they will this summer. There's a reason Spanish royalty shop at Massimo Dutti. The brand's pieces are always cut well, made from quality fabrics and rendered in very classy silhouettes. This work-ready skirt is the best item in store now. I wasn't convinced about wearing yellow head to toe until I saw this fantastic H&M dress. The slightly slubby-looking fabric makes it feel a little bit vintage, which is always something I look for when buying new items. Add a tan waist belt and this will look good every summer from here on out. I'm not a jealous person, but my colleague Emma now has two gorgeous Alighieri necklaces and they mesmerise me all day long. A pair of earrings is more my style (not much of a necklace or bracelet girl), and these artistic pearl-drop ones manage to be both unique and subtle. These have more than a whiff of "old" Celine about them. Get. Into. My. Closet. I'm a big fan of jazzy pants and haven't invested in a new pair for a long time. Dries Van Noten is a maestro when it comes to combining different colours. Picking out this rad-plaid fabric and then turning it into wide-leg pants was a stroke of genius! I've already had plenty of wear out of a pair of Van Noten culottes I bought second-hand a long, long time ago, so I know these will go the distance. Wandler's designer bags just get better and better each season. I already own a smaller, more rounded version of this in plain white and have worn it on repeat for the past year. They're surprisingly roomy, good quality and look far more expensive than the price tag. 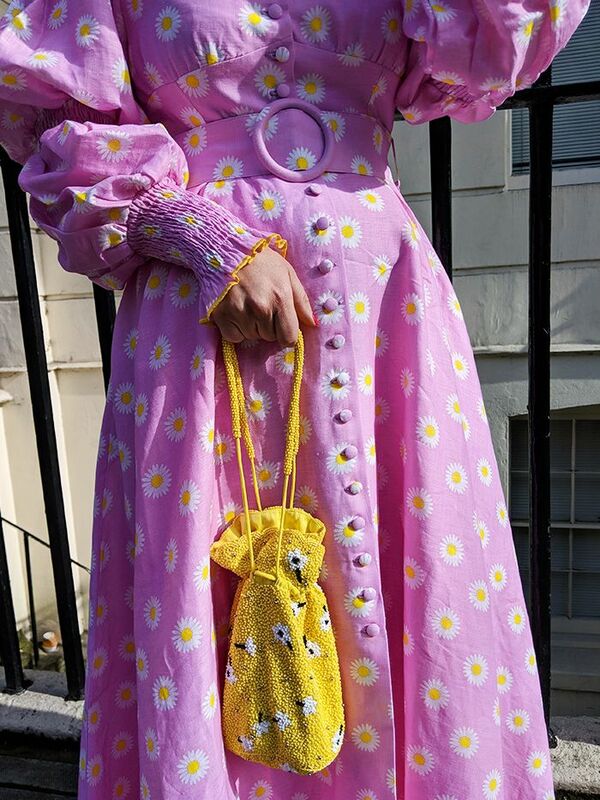 I realise that £780 is still a whopping amount to put down, but in comparison to the average £2000 you'll be looking at from a major fashion house, there's a compelling cost-per-wear calculation to make. So I've been getting carried away in H&M recently. Question: When did it get so good? This totally bohemian slip skirt looks more like a piece from Chloé than a Scandi high-street store. Sold. A few summers ago, I bought a gigantic braided beach tote from Mango and it's been an absolute winner on every holiday ever since. So I'm just recommending this new style to you, as it looks even better with the double handles and secure drawstring pouch. Such a sucker for statement earrings, and for £8, these can really do no wrong. I had heard of the magical things Agolde's Pinch Waist jeans do from my U.S. colleague Kat Collings. After trying them myself, I can confirm they're a very flattering shape. Being 5'1", I will need to either cut off the hems by a few inches or get them taken up, but this is par for the course when you're petite. The kind of wedding guest dress you can eat all the buffet in is my kind of wedding guest dress. I love to feel relaxed, comfortable and ready for the dance floor rather than trussed up in something too revealing, fussy or tight. Olivia Rose has mastered the art of smocking and is using it to great effect with this gingham dress. Shoes are my weakness. What can I say? Would you believe me if I told you this was Marks and Spencer? Five years on and I'm finally into the pink trend, but this skirt offers up a very good base for doing it in a cooler way. Add a neutral top and plain sandals and you won't feel overly frou-frou. I'm a big fan of sunbathing, but I also like to read at the same time, so a fabulous sunhat is key. This is one part safari, one part Little House on the Prarie. The holiday packing fanatic in me adores it. I have a feeling that vintage Christian Lacroix jewellery is going to have a comeback. You heard it here first. I've been getting heaps of wear out of a similar white cardigan. It's the one way I can tap into French-girl style and not feel silly. Next up, the best Zara pieces of 2019.